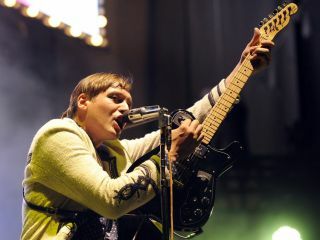 This single from Canada's Arcade Fire was featured on the deluxe edition of their 2011 album The Suburbs. The guitar riff is just one element in this heavily layered arrangement, which features lots of different instruments. The guitar part uses a capo at the 6th fret to help give the part its chiming quality. Despite the mellow feel, the song's tempo is quite high, so this picked riff can be tricky to master and it may take a little time to get up to speed. Start by working through the Video Lesson to get the notes under your fingers, then gradually build up the speed. Remember to focus on accuracy at all times. If you're hitting dead notes or picking the wrong strings, you need to slow down and focus on playing the part cleanly. There are no prizes for up-to-speed but sloppy performances. The bright, ambient clean tone is quite thin, so cut the bass and boost the treble. This is one occasion where adding a large dose of reverb will help the tone rather than detract from it. If you have a compressor, then use it to even out the attack of the notes and make the guitar part sound more consistent.